Snap! What Your Dog Wants You To Know About Thunderstorms And Fireworks from Carolyn Lincoln, DVM on Vimeo. Hi! It’s that time of year again when the skies are gonna open and we’re gonna get thunder and lightning. But even more disturbing is that we have July 4th coming up. So, I wanted to talk to you about how this can affect your dog and what you can do. I’m Dr. Carolyn Lincoln with Play to Behave and you can find out more about me at playtobehave.com. I’d really love it if you’d come over and join my group, my community, it’s the puppy and dog training group, and I will put that in the post above so you can click through and join if you’d like. There we can discuss things. I was driving through a neighborhood yesterday with very small homes, very cute and very nice neighborhood, but small yards and very small homes. And yet, these giant fireworks were going off. It’s like, “Great, we’re heading right into the weekend when everyone is firework-happy,” and if you have a dog who’s sensitive to fireworks, or a puppy, this is something that I know is probably on your mind. And then, of course, following that, from July to November we’re in the thunderstorm season. So, let’s talk about it a little bit. First of all, if you have a puppy, I just want to warn you that it might be very cute to laugh and smile when they get scared when there is a firework that goes off, or a thunderstorm, but that’s not a good idea. You want to comfort your puppy. You don’t want to over comfort him, and that’s where people make a mistake because if you keep trying to console them, “Oh, it’s okay, it’s okay,” and pick them up and hold them, you’re really sending a message that there’s something to worry about. And, likewise, your reaction matters. So, when a firework goes off that you weren’t expecting or when a thunderclap is super loud, we all might jump in our seats, right? But it’s how you recover after that, that would be normal for your puppy or dog to react the same way that you do, but once it’s over, once you collect yourself, you just go, “oh my gosh, it’s okay, good dog!” and don’t belabour the point. But if they need to crawl in your lap or they need to be near you, then make sure you offer that because you want to make sure they know they can trust you and rely on you to make them feel better when something’s scary. Now, when you get to the oldest dog–I’ll get to the dog in-between in a minute–when you get to the senior dog, a lot of times when they turn seven- or eight-years-old, depending on the breed and your particular dog, they might become nervous about thunderstorms and loud noises like fireworks at that age when they didn’t used to be. That’s because their hearing and eyesight starts to fail and they become less secure about the world around them, and you can see an increase in anxiety. Also, people tend to exercise their older dogs less, and so, again, they don’t feel as close to you, maybe, or they are a little bit worried about the world around them. So, they’re going to need some comfort as well. Now, you can have a dog that’s born just a more sensitive dog, just like you or people you know might be more sensitive and if that’s the case and they’re noise sensitive then you’re just going to have to accept that about them. You can make it a little easier on them with things like the vacuum or whatever, but it doesn’t mean that it’s ever entirely going to go away. So, there’s going to be cases with dogs, and this is especially in that middle area, where you end up with a dog who’s, say, from three-years-old to eight-years-old that’s totally freaked out by thunderstorms or fireworks. Sorry about the noise in the background, somebody is doing something with their lawn every single day of the week here, so I love it when I have a quiet, peaceful day and I can hear the birds. But, anyway, for those dogs that are really nervous, there’s a range of how sensitive your dog might be. If you notice that your dog has sensitivities then I would definitely put on a video of some kind. Set up your phone or your iPad to record your dog during the day. Even if they’re not in the picture, it doesn’t matter because you can hear them if they’re barking or whining or pacing, in most cases. Just set it up in the room that they’re in most commonly, you might have to do this more than once, and see how they’re reacting. If your dog is overreacting, you want to catch this as early as you possibly can. So, have somebody there with them if you know there’s going to be a thunderstorm coming up, or fireworks coming up. If you can’t have someone with them maybe you can hire somebody, like a pet sitter, for those particularly difficult times. If that doesn’t work, you might need to think about medication or supplements of some kind. Talk to your veterinarian about that, I’m not going to go over the specifics of the different types of medications you can use or supplements necessarily, I’ll talk about two different supplements that I like, but really you need to check with your vet just to make sure what’s going to be okay for your dog. And having them checked out to make sure everything else is normal is going to help because if they’re already in pain or uncomfortable because of some other reason, like maybe their hips are bothering them, they’re going to maybe overreact to sounds when they wouldn’t otherwise. I know this might also be a pain for you, and you think, “Oh, God, my dog is so sensitive and I have to be home, and this just isn’t fair,” yeah, sometimes life isn’t fair. Sometimes you end up with a person, or a dog, or another pet of some kind, or a job where you have to do things that you don’t necessarily want to do, but, you have to do what’s best for them, or things can just get worse. Usually a neighborhood kid or somebody would be happy to come over and make a little extra money, so that you know if there’s going to be fireworks or thunderstorms, your dog isn’t alone. Sometimes that isn’t enough and sometimes it is. A couple other things you can try using. One is thundershirt, I absolutely love thundershirts, I should’ve grabbed mine to show you. It’s like swaddling a baby, it’s very tight. There’s also one called an anxiety wrap, and there might be other one’s on the market you’d want to try, but for $30 or $40, you’re not sinking a lot of money into it, you could give it a try. I would put it on your dog before there’s a problem. Like on a beautiful day like this, go ahead and put it on your dog. Not when it’s too hot, but put it on your dog so that you can wrap them up in it and see how they feel. Many times they’ll be able to sleep because they feel like they’re getting that hug. Like I said, it’s like swaddling a baby, so it calms them down. This type of thing is also used for autistic children and it seems to help them as well. So, you could try that and see if it works. I’ve had great success with it. I would say 90% of people who I know who have tried it it’s helped. It might not take away everything completely, but it definitely helps. Another thing to try, and you can try them together, there’s no harm in that–Ray’s right here next to me, if I could move the camera I would show you, maybe at the end–you can try Adaptil, or Dog Appeasing Pheromone. There are many different ones on the market now, but I would stick with the one that you know that has research behind it and that’s Adaptil. There may be another one now with more research behind it, and if so, check the source of that research, when it was done, and who paid for it, all that kind of stuff, and if you think it’s good, fine. But I would stick with the one that I know is proven to show an improvement in the majority of dogs. That doesn’t mean it’s going to take away 100%, but it’s going to help. Don’t you want to help? Help is good! Right? It doesn’t have to take it away completely, so if you try Adaptil, I would start with that one, the Dog Appeasing Pheromone, and that is a chemical that is natural, that the body emits, and it sends messages. This particular one is sending a message that things are good and calm. The nursing mother puts it out for the babies, and so they should feel better. I’m super worried that my phone is going to die because I don’t have much power on it. If it does, I’ll try to pick this up later. Anyway, Adaptil is great because it’s synthetically produced, it doesn’t have any odor to you, you won’t notice it. You can use it as a diffuser in the air, you can use it as a collar, just look it up online and you can find out more about it, or you can ask me. That’s another thing I would try. Also not too expensive, yes, it might cost you 50 bucks for a months worth of it if it’s the collar or the diffuser, but honestly if it’s going to help your dog feel better it’s well worth it. So, the thundershirt I went over and I also went over the Dog Appeasing Pheromone. Two other things you might want to try are Solliquin, which is a supplement and dogs think it’s really tasty, it’s a treat. Like any of these other things, it’s not 100%, but it could help. It’s probably about the same price range, $30-$50 a month, depending, but it’s S-O-L-L-I-Q-U-I-N. It has a very effective ingredient called L-theanine which is made from green tea. Everything in it is natural. There’s a couple of metabolites from milk, which calm them down, and the last one I can’t remember. But, anyway, it works for a lot of my clients, and I’d highly recommend that. You can get that through your veterinarian. You might be able to find it on Ebay, you might be able to find it on Amazon, but I haven’t had much success with that. Your veterinarian may not have heard of it, but they might’ve heard of Anxitane, I’m not sure how to pronounce it, but it’s A-N-X-I-T-A-N-E, and that works very well too. And they might have some other supplements they recommend. But solliquin has the main ingredient, the active ingredient that Anxitane has, and it has other ones that, like, Zylkene has. So, I don’t know, I’ve had great success with it and, as I said, some researchers that I personally know, that are Veterinary Behaviorists, have done the research on it and have gotten some great results. So, you can try that, you can try it as an event, so you use it just the day of, start it a couple hours before, but I’ve had more success if you’ve had it on board for a couple of weeks. And you can stop and start it anytime you want. And the last one, what did i say… I can’t remember now… I’ll have to think about it. So, you can go with the thundershirt, the Dog Appeasing Pheromone, you can try the supplement that I mentioned–oh, see, now it’s telling me “low power mode,” oh, bummer. Okay, so I’ll make this quick. There’s other supplements that you can try, of course, and then there’s aromatherapy, there’s other things you can try. But I would start there, keep it simple, keep it simple. Just start with easy things and see if that doesn’t help your dog feel better, and let me know. And if you have any questions, let me know too because I can do another Facebook life and try to answer those for you. Again, this is Dr. Carolyn Lincoln with Play to Behave and you can find out more at playtobehave.com. I really hope you’ll come join my community, puppy and dog training, we have some great conversations in there. It’s right here on Facebook, so it’s easy to get to, you just have to ask to join. I’ll put a link in the post. Alright, you guys, have a wonderful weekend. Enjoy your 4th of July. I will be in Cape Cod, so if I can, I will broadcast from there, but typically I have bad internet when I’m there. So, I’ll answer questions or put up images or something in some other way to keep in touch. But if you’re in the US, it’s our birthday, so let’s celebrate. Have a great day! I have practiced veterinary medicine in the Cleveland area since 1990, with behavior medicine as my primary interest. 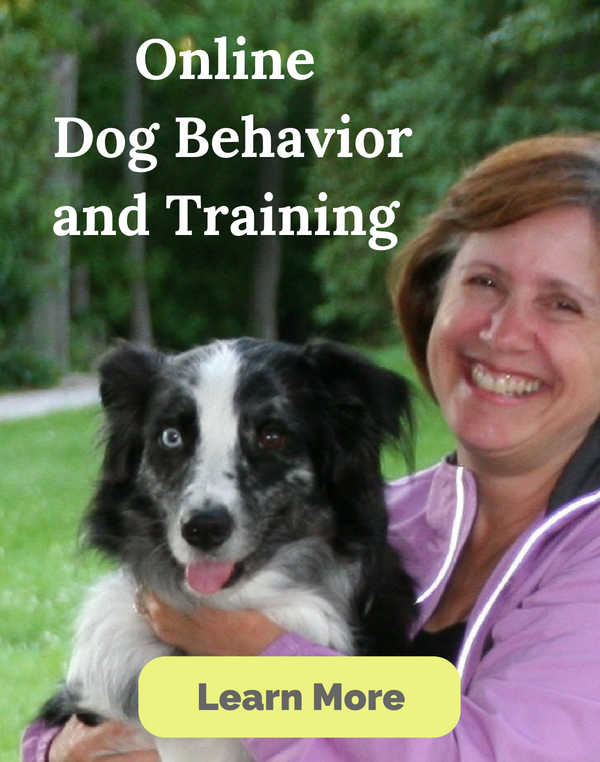 I help improve the behavior of dogs and cats through a variety of online courses. I also offer one-on-one and group behavior training sessions in the Northeastern Ohio area.